Frost seeding legumes and grasses is common means to improve forage yield or change the species composition of a pasture. Frost seeding offers several potential advantages: the ability to establish forage in an undisturbed sod, a reduced need for labor and energy compared to conventional seeding methods, the ability to establish forages with minimum equipment investment, a shortened “non-grazing” period, and a means to maintain stands at productive levels with both grasses and legumes. As with any method of forage establishment, seed-to-soil contact is critical for successful frost seedings. There are several management practices that can be done to help insure good seed-to-soil contact. The first involves fall grazing management. Graze pastures short in the fall or winter prior to frost seeding to open stands and expose soil. Sod-type grasses like bluegrass are the most difficult to make successful frost seedings, especially where a thick layer of thatch covers the soil surface. In these situations short duration animal hoof action after seeding is sometimes needed to enhance seed-to-soil contact. New seedlings must be given a chance to establish without excessive competition from plants already present in the stand. Reducing competition can be done in several ways. First, grazing pastures down to 2 inches in the fall will help to slow regrowth in the spring. Frost-seeded pastures need to be grazed regularly in the spring and summer to allow for light penetration into the plant canopy; however, it is also beneficial to move animals off pastures before young seedlings are consumed prior to adequate root development. The importance of reducing plant competition during the year of establishment was demonstrated in research done at Michigan State University (Leep, 1989). In this study, red clover and birdsfoot trefoil were frost-seeded into a sod that was either suppressed with a herbicide or cut from zero to four times following seeding. The more frequent cutting regime resulted in stand densities similar to or better than those of the herbicide-treated field plots. In many cases, frost seedings are made to introduce or increase forage legume species into a grass stand. Research and farmer experience has shown good results with red clover and birdsfoot trefoil. Alfalfa, alsike clover, and white or ladino clover have also been frost-seeded with varying degrees of success. Do not frost-seed alfalfa in situations where alfalfa plants already exist in the stand. Autotoxicity will prevent new seedlings from becoming established. Red clover is often frost-seeded every two to three years to sustain legume production. Sometimes it’s desirable to introduce grasses into old alfalfa stands. This offers some unique challenges because most cool season grasses do not establish from frost seeding with the success of legumes. A University of Wisconsin study compared frost seeding establishment of several cool-season grass species into older, established alfalfa stands (West and Undersander, 1997). In this two year trial, perennial ryegrass and orchardgrass exhibited the best establishment success, smooth bromegrass was intermediate in establishment, while reed canarygrass and timothy had the fewest productive seedlings develop. Although smooth bromegrass was only intermediate in establishment, its sod-forming growth habit would likely result in additional plant formation from rhizomes. Both perennial and Italian (annual) ryegrass are good choices for frost seeding where fast establishing, high quality pasture is desired. However, both of these species will not typically overwinter in Wisconsin and should be seeded with the intent of filling single-season forage needs. Based on Wisconsin studies, there does seem to be variety differences for Italian ryegrass establishment success with frost seeding. Current recommendations are to select forage-type, late-maturing Italian ryegrass varieties. Refer to the Forage Variety Update for Wisconsin (A1525) for additional information and ryegrass variety performance data. Broadcasting grass seed can pose some unique problems. When mixed with legume seed, grass seed will not “throw” as far and result in alternating strips of grass and legume plants. For this reason, it is recommended to seed grasses separate from legumes (i.e. make two passes) when using a broadcast seeder. Grass species like smooth bromegrass are often more easily established into an existing sod using a no-till drill early in the spring instead of a broadcast seeder. Where grasses are drilled into existing forage stands, mix light, large-seeded species like smooth bromegrass with a low rate of oats to prevent bridging and ensure uniform flow through the drill. At equal seeding rates, the number of seeds that establish into productive plants will be a lower percentage with frost seeding compared to conventional methods. However, frost seeding pastures almost always involves a resulting forage composition that will be a mixture since it is being done into some type of established sod. For this reason, seeding only one species usually does not require rates as high as those seeded with conventional methods into a tilled seedbed where a full stand is desired. 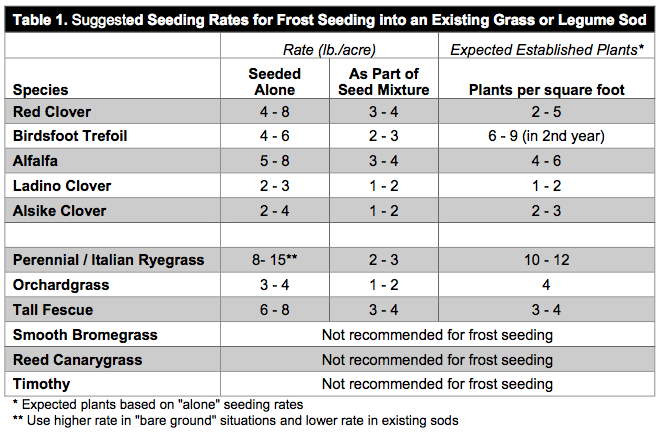 Frost seeding rates become a function of existing sod condition, species being seeded, and the desired number of seedlings in the final stand. Optimum seeding rates for specific pasture situations often need to be determined by trial and error over several years. Table 1 offers a starting point based on past research and farmer experience. There may be times when either higher or lower rates are justified depending on pasture and weather conditions. The fundamental principle behind frost seeding is that alternating freezing and thawing, along with spring rains, will help to incorporate the broadcast seed into the soil surface. Seeding on top of snow is acceptable only if the depth is not too great. The risk of seeding on top of snow is that a rapid meltdown may result in runoff of both water and seed. In Wisconsin, most frost seeding is accomplished during March. Where a new legume species is being introduced to the pasture, inoculate legume seeds prior to seeding. Bacterial inoculant is specific for each legume species. For example, alfalfa inoculant is not effective on red clover. There are many excellent tools for making broadcast frost seedings. These include seeders that mount onto ATVs and tractor 3-point hitch mounted seeders. Conventional roller and grain drill seeders can also be used but will require more trips across pasture. When using a spinner-type seeder, be sure to determine the effective seeding width for each seed type or mixture. This will vary between species. Frost seeding can be an effective, low-cost method to introduce new forage species into an existing sod or maintain the current forage composition of pastures. To be successful, good seed-to-soil contact needs to be accomplished by grazing or clipping pastures close to the soil surface in the fall prior to seeding. Best results are obtained in forage stands of non-sod forming species without a thatch barrier. After frost seeding, keep competition to a minimum by frequent grazing or machine harvests. Frost seeding success is usually obtained with legume species like red clover or birdsfoot trefoil but some grasses such as perennial or Italian ryegrass and orchardgrass can be successfully frost seeded with proper management. Base seeding rates on the current condition of pastures and the desired density of forage species being established. George, J. R., 1984. Grass sward improvement by frost-seeding with legumes. Proceedings of the American Forage and Grassland Conference. p. 265-269. Leep, R. H., 1989. Improving pastures in Michigan by frost seeding. Extension Bulletin E-2185. 4p. 3. Undersander, D. J. et al., 2013. Forage variety update for Wisconsin. Extension Bulletin A1525. Production and Use Symposium. Wisconsin Dells. p. 93-95.